Off Grid Info - Air Quality - Pollen - How Big Are Pollen Grains? It's such a shame that something as pretty (see below) as Pollen grains can cause problems. Pollen is microscopic grains produced in the male parts of flowers. Plants use pollen as a way to reproduce. "Pollen counts" (i.e. the amount of pollen in the air) are greatly increased during flowering seasons of plants. Usually this is in spring and summer - but flowering season varies depending on the type of plant, the climate and the geographical location. Allergy to pollen is commonly known as hay fever. Pollen from some plant types is smaller and lighter - and therefore can be carried futher by wind. Pollen can cause such trouble for hay fever sufferers that there's at least one web site - www.pollen.com - dedicated to providing a forecast of coming atmospheric pollen conditions. How big are pollen grains? 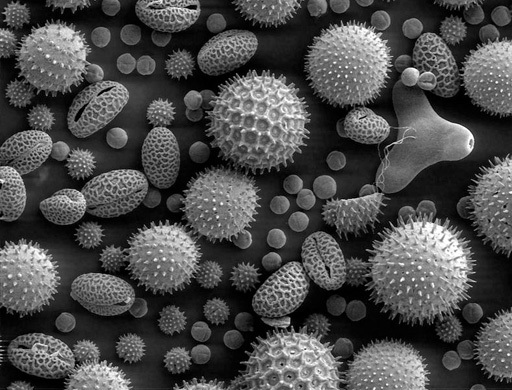 According to this article, pollen grains commonly range in size from 3 to 200 microns. Thus they would seem to fall well within the range of particle sizes likely to be caught by HEPA filtration. Ah the things that hide unseen at the edges of our reality! Pollen grains from sunflower, morning glory, hollyhock, lily, primrose and castor bean - under 500x magnification. Thanks to the Dartmouth Electron Microscope Facility for the public-domain image!